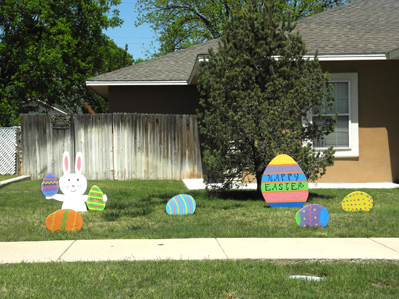 Signs of the impending Easter holiday were found springing up all over Artesia Saturday. In addition to the Community Easter Egg Hunt and various activities amongst local churches and organizations, families could also be found dyeing eggs, decorating, and shopping for the makings of the Easter meal. Above, colorful wooden egg, bunny and carrot figures can be found in the yard of this home in the 500 block of Washington Avenue. 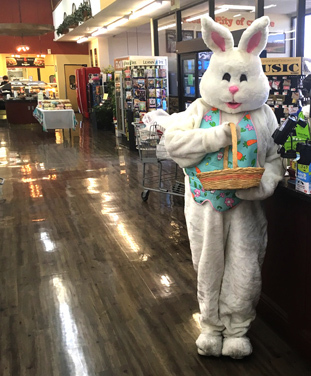 Below, the Easter Bunny made appearances over the weekend at Fenn’s Country Market, greeting customers and their children with candy, pausing for hugs, and posing for photos.